Yesterday's Tmac's Teachable Moments featured excellent anticipation and positioning from 3B Umpire Chris Conroy in San Diego on a tag play at third base. 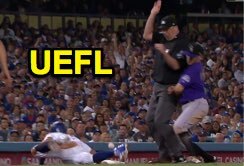 Tuesday night in Los Angeles, best intentions proved unfortunate as Lance Barrett blocked Rockies SS Garrett Hampson from attempting to catch an underhand toss from Nolan Arenado as Dodgers baserunner R2 Austin Barnes dove back in to third, leaving the umpire in a most vulnerable position, stuck between a Rockie and a hard base. Sidebar: "Umpire Obstruction" is part of the title only. There is no such rule as "umpire obstruction." Please don't call "umpire obstruction" in a game. It doesn't exist. See the following examples and discussions of what umpire interference is and is not. Related Post: Case Play 2018-8 - Kick a Ball, Make a Call [Solved] (9/14/18). Related Post: Stayin' Alive - The Umpire-Aided Triple Play (4/23/18). The Play: With one out and one on (R2) in the bottom of the 5th inning—similar to Conroy's SD situation—Dodgers batter Chris Taylor hit a weak ground ball up the third base line, fielded by Rockies 3B Arenado, who faked a throw to first before turning and tossing the ball back toward third base in an effort to catch baserunner R2 Barnes, who had rounded the base, off-guard. Covering third on the play was Colorado shortstop Hampson, who looked poised to field Arenado's throw...with just one problem: 3B Umpire L Barrett, positioned on the foul line, jumped to his left in an attempt to avoid being hit by the throw, and, in doing so, collided with shortstop Hampson, resulting in Barnes scoring the Dodgers' tying run. Barrett cedes ground to the pitcher and ball. 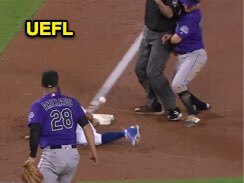 Analysis: Possibly anticipating an attempted play at third base involving the pitcher Kyle Freeland, who, after running up the line, peeled off at the base and turned left, into foul territory, 3B Umpire L Barrett positioned himself in a spot along fair territory that would allow him to get a better look at the play involving Freeland, who was stationed in foul territory. Had pitcher Freeland fielded the throw and attempted a tag on the runner, Barrett would have been in optimal position to rule on the play. Instead, it was an unfortunate read as shortstop Hampson was the chosen wheel play fielder, meaning that in order to field Arenado's throw, Hampson, from his position in fair territory diagonally behind the third, had no where else to go but directly into the umpire, who was avoiding the ball while likely still allowing the uninvolved pitcher an opportunity to field it. 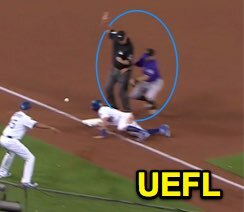 Joe Davis: "Illegal moving screen on Lance"
Rules Review: Again, this is not umpire interference and umpire obstruction does not exist. This is an unfortunate instance of incidental player-umpire contact whereupon the ball remains live. Similar Play: As we said in yesterday's Episode 4VM of The Plate Meeting podcast, 3B Umpire Conroy did an absolutely fantastic job of preparing for and reading a potential tag play at third base on a weakly hit ground ball in front of first base. Conroy scampered into foul territory and from an angle perpendicular to the foul line found his keyhole view of the fielder's no-look tag of the runner just prior to the latter's touch of third base. The main difference between these two plays—other than the direction of the batted ball hit toward first base in San Diego and toward third base in Los Angeles—is that the pitcher and shortstop in San Diego did not complicate matters for the umpire. In Conroy's play, it was the third baseman and only the third baseman who could have fielded the throw and tagged the runner. In Los Angeles, however, the X's and O's moved around so much that the umpire had to essentially choose which fielder was most likely to make the play. Unfortunately, it simply didn't turn out to be the pitcher. Related Post: Tmac's Teachable Moments - Video Analysis of Four Plays (9/18/18). Barrett and Hampson collide near third base. Could our umpire have taken the unconventional exit route of running forward, toward home plate in an effort to avoid a potential backchecking shortstop? Possibly, but also bear in mind that the keyhole angle gets smaller and smaller when we make odd positional adjustments in an effort to avoid an exploding play. Then again, with the pitcher several yards onto the foul territory grass, what play is really left for him, other than to retrieve a loose ball with very little chance at the runner? In general, running or moving forward gives officials a much higher likelihood of not colliding with a player or base coach (since we can usually see what's in front of us), while jumping backwards is the most risky direction. Conclusion: We've often heard the case that an umpire's job becomes a lot tougher when players make mistakes, quite often due to the improvisation involved with getting into position to officiate a broken play. Here, as the result of an improvised play, Barrett inadvertently and incidentally hops laterally into the shortstop's path, who, himself, likely in an attempt to avoid the umpire, incorrectly guessed where the umpire would go in order to avoid being hit by the ball, resulting in a run-producing error.